Currently I'm listening music via a 2.5-way floor standing loudspeaker called DoppelWhopper with AUDAX/SCAN SPEAK-loudspeaker chassis. The bass-midrange chassis AUDAX HM170Z0 is used in famous loudspeakers like the BURMESTER 949 First (approx. 10000 €/pair, test in STEREOPLAY 05/98), the IQ 200/300 (3500/4500 €/pair, test in STEREOPLAY 11/94 or AUDIO 12/94) and showed good properties in the KLANG & TON comparison test of 17cm High-End bass-midrange chassis (see issue 06/93). In many loudspeakers in the 3000 €/pair class you can find the SCAN SPEAK D2905/9X00 (e.g. IQ 200/300, WILSON BENESCH Act One etc.). 3 of 4 passive loudspeakers that are rated 'exceptional' by STEREOPLAY (ALR Factor 7, AUDIO PHYSICS Caldera, CHARIO Academy 3) use this type of tweeter. The comparison test of High-End tweeters in KLANG & TON (see issue 01/93) demonstrates why. Corresponding to the statements on the Tips for impatients page I've chosen a 2nd 17cm bass chassis for support of frequencies below 350 Hz. The bass-midrange chassis runs in parallel even to the lowest frequencies but shows only few excursion due to its 12 l closed box design. 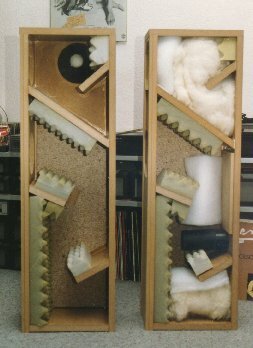 The bass chassis works in a 30 l bass reflex box. The frequency response of this type of low frequency design can be easily adjusted in a wide range by changing the Helmholtz frequency or even blocking the vent to harmonize with the frequency response of the reproduction room (see Tips for impatients). Due to its favorable Thiele/Small-parameters and its identical design the AUDAX HM170G0 was chosen as bass chassis. According to the flow diagram I first built test enclosures for all 3 chassis (incl. the tweeter), so even the placement of the bass-midrange chassis and the tweeter were variable. After several iterations (including time alignment and the development of specific dividing networks for each setup) a chassis placement with centrally mounted teeter and top mounted bass-midrange was found to give the best results with this set of chassis. Due to some colorations of the bass-midrange chassis above 2.5 kHz the acoustical cutoff frequency was set at 2000 Hz. Because of thermal and mechanical reasons the tweeter must be high pass filtered with 18 dB/octave at 2200 Hz (electrical cutoff frequency). The bass-midrange is low pass filtered (slightly underdamped) at 1500 Hz (electrical cutoff frequency). Combined with the frequency response of the chassis themselves an acoustic 4th order Bessel characteristic with 2000 Hz cutoff frequency is achieved. If you want to build the DoppelWhopper you'll find a detailed construction guide (German!) as PDF-file. Further interesting speaker projects can be found on my link list. Since a while a provoking statement of Peter Krips concerning horn loudspeakers can be found in the internet ("Hörner - Voodoo - oder mehr??" (in German) (= horn loudspeakers - voodoo - or more?) that is discussed pretty controversial in several German forums. Bearing in mind the complexity of the theme a forum discussion is a bit difficult especially if a detailed argumentation is desired. One by one the advantages of horn loudspeakers are teared apart until only the disadvantages (coloration, size, complexity, price etc.) left over. For mid and high frequency horns I agree with Peter's argumentation that the supposed higher efficiency is realized only by focusing the radiated energy on the main radiation axis. For public address applications this is a highly desired property. For HiFi applications often the total energy of the diffuse sound field is higher than the direct radiation. Therefore the off-axis radiation is much more important. Even for optimum transformation of the radiation resistance 50% power efficiency cannot be exceeded which correspond to 109 dB/W/m for half space radiation. Horn loudspeakers that show a higher efficiency MAY ONLY achieve this by concentrating the energy on-axis. By definition they MUST radiated less off-axis (see K&T 3/98)! It is very hard to extrapolate this thinking to the low frequency range. The dogma of omni-directionality in this frequency range is deeply embedded. For the usual diaphragm diameters of less then 30cm this is true below 200 Hz after all. However, the mouth of bass horns often have significantly higher equivalent diameters so that this frequency is shifted even lower. For the evaluation of the equivalent diameter not only the pure mouth area may be considered. If the mouth is adjacent to the floor and/or the wall these planes increase the effective horn length and thus produce a horn with bigger mouth area. Moreover the direct "reflection" of the mouth creates a virtually bigger mouth area (including the mirror images) with accordingly higher directivity. But what is the benefit of this higher directivity? Especially in the low frequency region the sound field is very diffuse (due to missing absorption). This will cause the summation of sound radiation of all directions anyway (thus yielding the total radiated sound power), so what? But maybe this is the key to understand the effect of low frequency horns? As a single "Buschhorn" (so called according to it's creator Dr. med. A. Buschhorn, Göttingen) resided in my cellar room already for a while I spend an hour or so on one of these famous long winter evenings to do some quick measurements SB_OCT. With the Buschhorn there is a very obvious positive effect of the horn which I just wanted to document. The Buschhorn is a 2-folded back loaded horn mainly for small full range speakers like the VISATON FRS8 or the ACR FE83 with a coupling volume of 2.8 l and living room friendly dimensions (H=92cm, W=15.4cm, D=33cm). The horn constant of the Buschhorn is about 1.82 [1/m] yielding a horn cutoff frequency of about 49 Hz. The horn length is about 173cm (+ about 18cm mouth correction assuming free field radiation). Interpreted as a transmission line this would give resonances at 45 + n x 90 Hz. According to an article of D.B. Keele ("Low-Frequency Horn Design Using Thiele/Small Driver Parameter", presented on the 57th convention of the Audio Engineering Society, Los Angeles, May 1977, Preprint 1250) for the VISATON FRS8 within in Buschhorn the low pass effect of the coupling volume starts about 675 Hz, whereas the low pass effect of the moving mass starts already at about 180 Hz. Thanks to Dr. Buschhorn you may download a plan of the Buschhorn (87 kB PDF-file). Near to the horn mouth high radiation around 110 Hz and some minor peaks at 180 and 280 Hz are obvious. Result: Besides the main peak at 110 Hz minor peaks at 80, 100, 210 and 285 Hz come up in the room. This result is obviously heavily depending on the room itself and the exact positioning of the speaker inside the room. In general the decrease towards lower frequencies with closed horn mouth (approx. -5 dB/octave below 300 Hz) is changed to a slight increase (approx. 1 dB/octave) down to about 80 Hz (linearity +/- 4 dB)! The dip around 100 Hz with closed horn mouth is caused by reflections of the floor and a sideboard (detour about 170 cm each = half wavelength (180° phase shift) at 100 Hz)! As the horn mouth is located at the rear of the loudspeaker a higher directivity would cause less input to the microphone in front of the speaker. But as only the vertical dimension of the horn mouth is "big" the directivity is increased only in vertical direction. Horizontally the small mouth dimension has only a minor effect on directivity. By concentrating the energy vertically (thus not allowing so much energy to be radiated to the ceiling etc.) the high influence of the horn mouth at the microphone position might be explained. Remark: Die Buschhorn stands upright on the floor, 16cm from the rear wall and 80 cm from the side wall(room dimension: W=5m, D=4.5m, H=3m). Results: Due to the spatial averaging (good repeatability, see curves 1 and 2) the results look smoother. In principle they show the same results as above. As the horn mouth has a must better location to radiate low frequencies (amplification through floor, rear and side wall), the comparison with open (curves 1 and 2) and closed horn mouth (curve 3) is somewhat unfair. 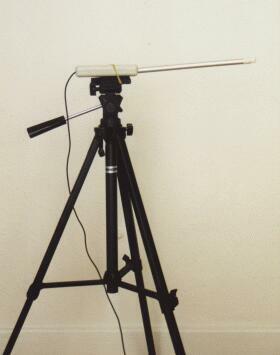 Therefore the Buschhorn with closed horn mouth was also measured "turned over" (standing n top, the speaker now radiating to the rear wall -> curve 4). But even in this position a lower spatially averaged sound pressure level was measured. This is even true when both results with closed horn mouth are summed up (curve 5)! Between 50 and 140 Hz the horn delivers a gain of at least 6 dB (even compared to the "turned over" speaker) and extends the low frequency range of the FRS8 by about one octave (from 140 Hz to 70 Hz). With more ideal placement and more effective usage of room resonances the 115 Hz peak might be reduced and the cutoff frequency lowered down to 60 or 50 Hz. Remark: With sinusoidal excitation and clearly visible excursion the FRS8 was operated in free air and then pressed on the horn. The variation of the excursion was evaluated subjectively. Result: In the whole frequency range no obvious reduction of speaker excursion could be detected, except around 45 Hz (approx. Lambda/4- and horn cutoff frequency). Although the statements of Peter Krips originally were in contrast with my attitude most of them were confirmed by the measurement results on the Buschhorn. The 6 dB gain of the horn below 140 Hz might be caused by the higher directivity in vertical direction which concentrates the sound energy in the lower part of the room. Thus more energy reaches the microphone (and the listener) after a shorter time period (= less energy reduction). Even the rumor of lower speaker excursion must be buried: with the same input voltage the same speaker excursion is created, with or without horn. Nevertheless the generated sound pressure level with horn and identical excursion is higher. Even the transmission line like behavior of a back loaded horn could be observed because of the reduced speaker excursion around the Lambda/4 frequency. The measurement results including comments (German only) can be downloaded as a simple interactive presentation (the batch file Horn_Res.bat starts the presentation). Most people who deal with loudspeaker development after a while want to support the development process with measurement results. But even people who struggle with resonances in their listening room may speed up their trial-and-error phase with measurements. Although a lot of measurement programs are available in this field (e.g. SB_OCT) there is very few support on the microphone side. Some kind of standard solution might be the proposal in KLANG & TON (Heft 05/1997) which is distributed by W. Fröhlich. For about 25 € you get a good microphone capsule, cables, plugs, switches, a small box etc. What a pity that a pre-amplifier was forgotten! Why do you need a pre-amplifier? For that you have to know that normal microphone capsules have a typical output of about 5 mV/Pa. As 1 Pa corresponds to an already quite high sound pressure level of 94 dB (in 1m distance an ordinary 8 Ohm tweeter with 90 dB/W/m needs already 5 Volts input voltage or 3.2 Watt input power with sinusoidal excitation which is pretty near its thermal power handling capacity) you won't apply these levels without using ear protectors (which are mandatory in the production for a sound pressure level of 85 dB(A)!). This means that the microphone output signal during a loudspeaker measurement is often much less then 5 mV! For these reasons one should only use the line input for serious measurements! Therefore I've build up a measurement microphone with build-in pre-amplifier. As a basis I selected a tried-and-tested kit from CONRAD-Elektronik so that the building should not cause any problems (order numbers and prices from catalogue 2003 ) . Besides the components below you only need an aluminum tube (outer/inner diameter 12/10mm, length about 260mm). Unfortunately since begin of 2002 CONRAD sells another pre-amplifier kit with the same order number. Thus the photos below do not represent the actual version of the kit. Nevertheless I've built this new kit and found severe deviations in the lower frequency range (see below). Therefore the condenser C5 (2.2uF) must be replaced by a series connection of 22uF and 100 Ohm. Both components are already included in the above list. The "old" kit can still be purchased under order-nr. 197688-77 for 7.95 €, but only without the microphone capsule. I've compared the so build microphone ("old" version, see above) with a professional BRÜEL & KJAER microphone Type 4188 (price about 1250 €). I've adjusted the internal amplification to give a sensitivity of about 1000 mV/Pa (which would correspond to 0 dB in the graphic below)! This allows to use the full dynamic range of the line input of sound cards with pink noise excitation of realistic levels in 1m distance (or at the listening location). Although the frequency errors are slightly higher than for the K & T-proposal (5 dB peak versus 3 dB for K & T) the frequency range around the capsules resonance is less "wavy" (1/12th octave bands calculated out of narrow band data). Finally I've compared the electrical behaviour of the "old" (MicPre2) versus the "new" (MicPre3) pre-amplifier (without capsule). Additionally the ELV-kit No. 17064 (rauscharmer Mikrofon-Vorverstärker) was tested (MicPre4). Although the later is by far the best choice electrically this kit doesn't fit into the softline box! The "new" pre-amplifier has a maximum amplification of 40 dB while the "old" pre-amplifier delivers up to 60 dB gain. The ELV pre-amplifier delivers even 70 dB gain. Assuming a capsule sensitivity of about 4 mV/Pa the "new" pre-amplifier yields an overall sensitivity of just 400 mV/Pa. The maximum output voltage is about 500 mVrms for the "old" pre-amplifier but only 300 mVrms for the "new" one. The ELV pre-amplifier also reaches 500 mVrms (all values with 9V voltage supply). Assuming a gain of 40 dB and a capsule sensitivity of 4 mV/Pa (-> overall sensitivity of 400 mV/Pa) this corresponds to a maximum sound pressure level of 91.5 or 95.9 dB, respectively. The "new" pre-amplifier without modifications has a clear low frequency slope below 700 Hz (-20/-30 dB at 50/20 Hz). Only by exchanging the condenser C5 (2.2uF) by a series connection of 22uF and 100 Ohm a more practical low frequency slope below 60 Hz can be achieved (-2/-12 dB at 50/20 Hz). The ELV pre-amplifier works extremely linear (+0 / -2 dB) within the frequency range from 20 to 20k Hz. For the "old" pre-amplifier the distortion level can be adjusted with poti 1 as low as 0.2% at 1 kHz (not audible). The "new" amplifier allows no tuning and shows distortion levels of more than 1.5% (clearly audible). The ELV pre-amplifier features extremely low distortion levels. In all cases only the nominal (not individual) frequency response of the reference microphone was used!